garpu What's MinGW used for now when building it? Oh, I bet it's for the change in libwine.dll. That would make sense--you just cross-compile them now. Although why would one use WINE dlls on Windows? Wouldn't you use windows dlls on windows? did the intro for Blazz blue worked or its like guilty gear on proton? also, can you test guilty gear? My guess is it could be used for debugging. so instead of an entire feature be missing, or they have to pay the royalites for each player who want to play the game on linux, they can pay once and get ride of the royalites entirely. Some old Windows dlls might be hard to find now. It is complicated, but I'll tell you what I believe is true, though this requires some detail ( sorry! ). The Wine Project contains a native OS library, called "winelib", that implements the lowest level layer of pure 'C' language Windows APIs that is generally known as WIN32. If you have the source code for an WIN32 application, you can compile directly against this "winelib" implementation, resulting in an entirely native binary that you can run directly on your OS. Wine also provides a "virtual Windows" environment if, as is more usual, you do not have the source code. This environment knows how to read Windows-formatted executables/libraries, and load them into memory to run as if they are native-format for your OS. It also knows how to slectively combine Windows-formatted executables/libraries with the winelib implementation of any WIN32 function calls the executables/libraries make. This "mixed mode" of Windows-format executable code, combined with the native winelib implementation of WIN32 is enabled by using a Wine virtual filesystem, better known as the "Wine Prefix". If you look at "C:\windows\*" in your Wine Prefix ( the default location is "~/.wine/" under Linux ) you will see directories full of the same filenames you normally see on windows. But if you look carefully, you will note that all of the libraries ( C:\windows\system32\*.dll, for example ) are tiny files, and all the same size. This is becaus they do not contain any implementation, they are just entry points to winelib; these entry points are what wine refers to as "builtin" versions of windows libraries. If you use wine to run a Windows-format executable, it uses these tiny "builtin" dlls to invoke the implementation in winelib. But what if you have problems, and the winelib implementation of a windows library does not work well with your Windows application? Well, you CAN try to replace the offending winelib library, by just overwriting the version in the Wine Prefix with one copied from a Windows installation, then run the "winecfg" command to tell wine you have replaced the builtin library. If you are lucky, it solves your problem. If you are unlucky, the problem gets worse, or you end up replacing half of your Wine Prefix trying to work out which combination of dlls works best. Now, why did I go into that detail? 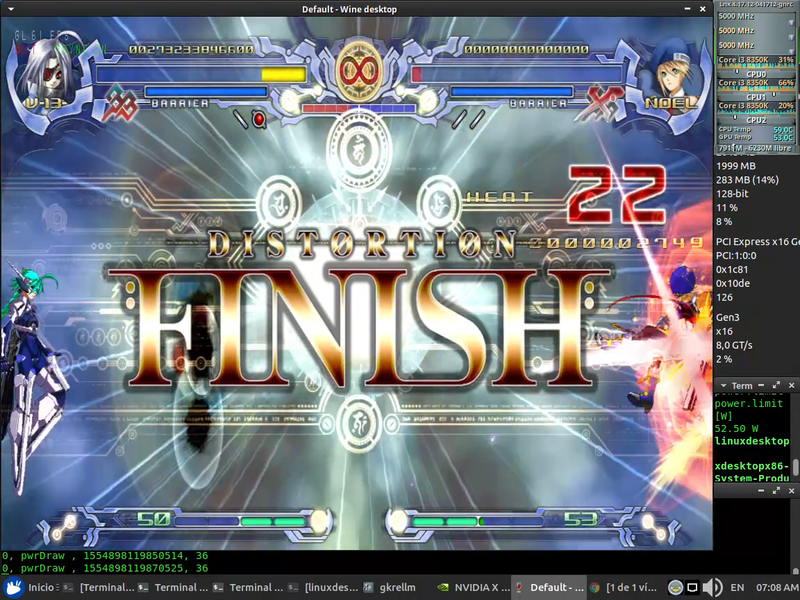 The reason is that this is the mechanism by which DXVK is implemented. Wine does not actually contain a working implementation of D3D10 or D3D11 in winelib. The "correct" way to fix this would be to join the Wine project, learn all about the existing winelib code-base and coding practices, then design and implement a harmonious, bug-free, maintainable implementation of D3D10/11 within winelib. What Philip Rebohle decided to do was create a replacement for the set of DLLs that normally provide D3D10/11 in Windows, using Vulkan to implement the D3D features, then you simply drop these DLLs into a Wine Prefix, use winecfg to indicate you are overriding the builtin implementation for these DLLs, and magically your game works. I can completely understand why Philip did it this way, as it means he does not impact the Wine Project at all, does not nead to learn how to be part of it, and can just get on with making DXVK work in a development environment he is comfortable with. However, there is a problem with this. While 4 of the 5 DLLs DXVK replaces are stand-alone and independent, DXGI.DLL is not. DXVK will allow you to run D3D10 and D3D11 games, but breaks games using WineD3D, which also implements DXGI.DLL. This is why the Wine developer was trying to coordinate DXGI use with Philip Rebohle. I'm sure this will get sorted out eventually. The detail is welcome. Thanks, that was very helpful. etonbears It is complicated, but I'll tell you what I believe is true, though this requires some detail ( sorry! ). Wow, very informative. Thanks for this great post!